The Russian oil giant is considering the issue of ruble bonds for an unprecedented $2.4 trillion rubles. Experts believe the bonds could be an attractive investment for Asian funds with an interest in energy resources. Oil giant Rosneft is discussing the possibility of issuing ruble bonds for an unprecedented $2.4 trillion rubles ($65.5 billion dollars). This would allow the state-owned petrochemical company to partially refinance its multibillion dollar debt as the ruble continues to weaken. According to experts, another reason for the decision is likely to be a big upcoming project which may require additional funding. These bonds may be of interest to investors, especially those in Asian countries who are interested in energy resources. According to the Russian daily Kommersant, the bond issuance is planned to take place in 11 tranches, each of about 220 billion rubles ($6 billion dollars). The company may register them within the next two weeks. Rosneft has declined to comment, though a source in the state-owned company said that it "uses a variety of sources to attract liquidity". 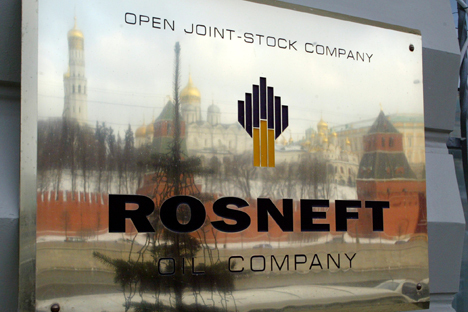 Rosneft has previously used ruble bonds, but in smaller amounts. In November 2013, the 14th tranche of 300 billion ruble 10-year bonds was admitted to trading of securities. From this, in December, 40 billion rubles were sold at the rate of 7.95 percent, and 35 billion rubles at 8.9 percent in February. A source in the financial industry said that 2.4 trillion rubles is "a colossal amount and it is not clear what the company can expect". It may be difficult for Rosneft to collect such funds in one fell swoop. But a source close to the company stated that it is not unlikely that they will release all of the bonds immediately. Rosneft could theoretically in this manner refinance large dollar debts, according to an undisclosed source. The company’s net debt at the end of 2013 was 1.9 trillion rubles, according to an IFRS (International Financial Reporting Standards) report on state-owned companies. Another publication believes that Rosneft is preparing for possible negative scenarios resulting from the introduction of sanctions on Russian businesses, saying that "the company is credited in Western banks, making the ruble a diversification tool." Marianne Tkachenko, a portfolio manager at Allianz Investments, thinks it is not unlikely that part of the bonds will be a replacement for loans. The sale of the bonds involves a wide range of investors, she says, which may be Russian or foreign banks and investment funds, especially funds in Asian countries which are highly interested in energy resources. Buyers could also be large domestic banks and pension funds, said a spokesman for a Russian management company.